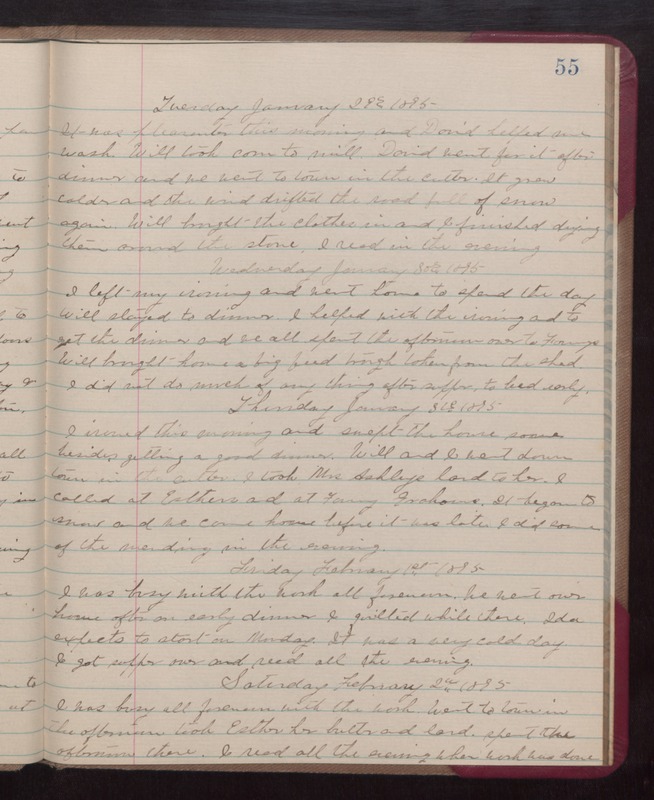 Tuesday January 29th 1895 It was pleasanter this morning and David helped me wash. Will took corn to mill. David went for it after dinner and we went to town in the cutter. [note to whoever: a cutter is a light-weight sleigh] It grew colder and the wind drifted the road full of snow again. Will brought the clothes in and I finished drying them around the stove. I read in the evening. Wednesday January 30th 1895 I left my ironing and went home to spend the day. Will stayed to dinner. I helped with the ironing and to get the dinner and we all spent the afternoon over to Franks. Will brought home a big feed trough taken from the shed. I did not do much of any thing after supper. to bed early. Thursday January 31st 1895 I ironed this morning and swept the house some besides getting a good dinner. Will and I went down town in the cutter. I took Mrs Ashleys lard to her. I called at Esthers and at Fanny Grahams. It began to snow and we came home before it was late. I did some of the mending in the evening. Friday February 1st 1895 I was busy with the work all forenoon. We went over home after an early dinner. I quilted while there. Ida expects to start on Monday. It was a very cold day. I got supper over and read all the evening. Saturday February 2nd 1895 I was busy all forenoon with the work. Went to town in the afternoon took Esther her butter and lard. spent the afternoon there. I read all the evening when work was done.